This wonderful musical money box is fitted with a clockwork wound musical movement. 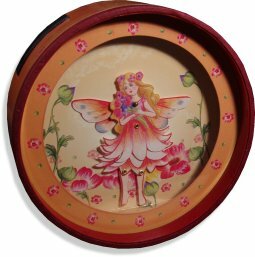 When a coin is dropped into the money box, the movement plays its tune once and the fairy dances to the music. A really great gift idea. IMPORTANT NOTICE - Please be aware that although these are childrens music boxes, they do contain small parts and a removable metal key. Therefore, they should never be considered suitable for very small children or babies. Children should be supervised at all times. If you are unsure about suitability, please telephone and ask one of our staff for guidance.